Salon reports the brothers are rebutting the story even before it appears in reliably friendly (i.e., biased) publications: the Washington Examiner, the Daily Caller, and U.S. News and World Report. The Bloomberg story appears to focus on malfeasance or fraud. One of those episodes apparently involves bribery by a Koch subsidiary in France, according to the piece by Washington Examiner editorial page editor Mark Tapscott. 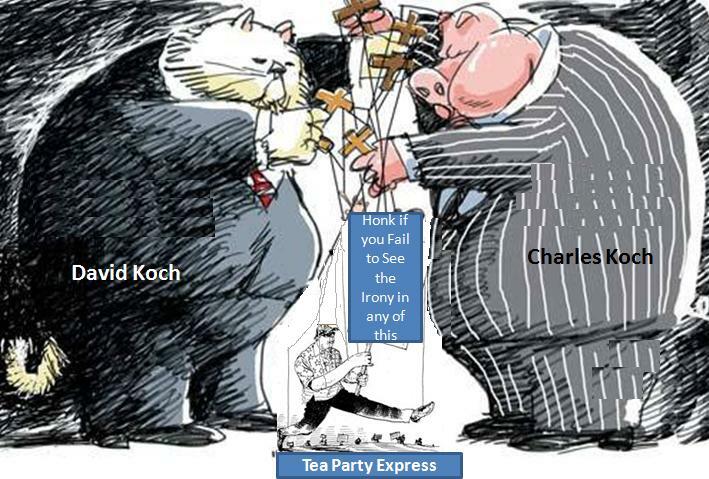 He reports that "Bloomberg reporters have been trolling among former Koch employees overseas in search of disaffected voices willing to talk," but Tapscott suspects the story may be animated by bias against the Tea Party. And he notes that, "Koch USA officials say they were as surprised and angered as anybody else when they were first apprised of the bribery allegations, and moved as quickly as possible to get to the bottom of the situation and fix it." Archvillain stereotypes David and Charles Koch are reportedly furious because rival New York billionaire Mike Bloomberg’s media machine is reportedly about to publish some big scandal story that proves the Koch Bros. are even worse than previously thought. Twenty years after Jerry Brown ran for president on an anti-corruption platform, American cities and towns are finally acting on his words. In the 2010 US Supreme Court case, Citizens United v. Federal Election Commission, the judges of the highest court in the land narrowly ruled that corporations were "people" with First Amendment free speech rights. The corollary of this judgment is that corporations, as "persons," have the right to contribute unlimited funds to political campaigns as an exercise of their free speech. On the one-year anniversary of the landmark decision, a survey conducted by Hart Research found that only 22 percent of American voters were even familiar with the Citizens United case. However, the same study showed that nearly four in five (79 percent) of Americans were in favor of passing an amendment to overturn the decision and clarify that corporations should not have the same rights as people. Cities and towns around the country are trying to stop the corporate corruption of our political process. Recently, the city council of Boulder, Colo., voted to put a referendum on the November ballot to amend the US Constitution to reflect that corporations are not people and money does not equal speech. So did the city council of Missoula, Mont. Last November, Pittsburgh adopted an ordinance that bans fracking and eliminates corporate personhood rights within the city. In York reports that resolutions banning corporate personhood have passed in Madison and Dane County, Wisc., in Humboldt County, Calif., 10 towns in Pennsylvania and two in Maine. 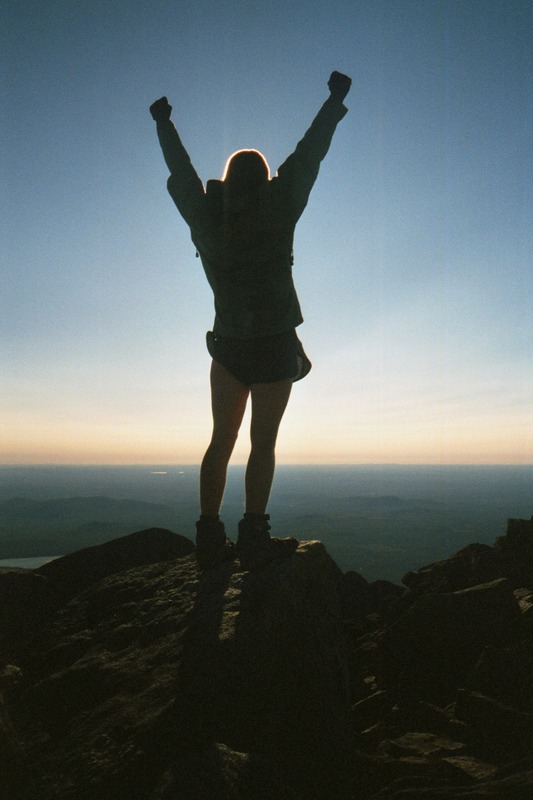 Resolutions have also been introduced in the states of Vermont and Minnesota. Move to Amend is behind many of these efforts. The group posted a map of places around the country where resolutions passed to amend the Constitution to ban corporate personhood here. There's a long, long way to go before the Constitution gets amended. A proposal has to be approved by Congress or the states, and then it has to be ratified by three-fourths of the states. But the point of the exercise is to build a movement to get corporate money out of politics. And that sure seems worth the effort. Gov. Scott Walker's chief of staff who helped guide the administration during the tumult over public-employee unions and passage of his first state budget is stepping down. Keith Gilkes says he's resigning as of Oct. 8 to return to his business as a political consultant. He says he may get involved if Democrats try to recall Walker. Gilkes says his resignation is unrelated to an ongoing secret investigation that stemmed from questions of whether current and former Walker aides took part in political activity on taxpayer time. He says he just felt the time was right to return to the private sector. Koch whore Wisconsin Gov. Scott Walker will be treated to the sight of a "Recall Scott Walker" banner flying over tomorrow's Badgers-Cornhuskers game. Walker is scheduled to watch the contest from a private box, where he'll be insulated from the hoi polloi but not the banner overhead. OneWisconsinNow is sponsoring the banner to support the Recall Walker effort. We look forward to the youtube video that records the crowd's reaction. 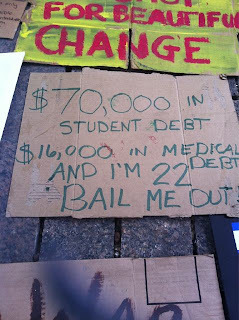 Above, last night's Occupy Wall Street March. They also leafleted with CWA members picketing Verizon. More and more people are declaring their support for the movement, including U.S. Sen. Bernie Sanders, Kansas state Sen. Marci Francisco and San Francisco city Supervisor John Avalos, who rallied demonstrators before they marched to a JP Morgan Chase bank branch, where six were arrested. What I appreciate about what’s going on in New York right now is that there is a spotlight being focused on Wall Street. We desperately need that. If we are going to get out of this recession, if we’re going to create the millions of jobs we desperately need, we need real Wall Street reform. A lot of people don’t know this, you have six financial institutions the largest six banks in the country who control sixty percent of the assets in the United States of America. After we bailed them out because they were too big to fail, three of the four largest financial institutions actually became bigger. I will take back what I've seen to Kansas. ...The United Federation of Teachers; 32BJ SEIU & 1199 SEIU; Workers United; and Transport Workers Union Local 100, which has 38,000 members. Additionally, Working Families Party, Moveon.org, Make the Road New York, the Coalition for the Homeless, the Alliance for Quality Education, Community Voices Heard, United New York and Strong Economy For All are involved in the organization of the march. "Occupy Asheville" will "officially" kick off this Saturday, October 1, 2011, at 11 am in front of Jubilee Church on Wall St in Asheville, NC, with a memorial service for Troy Davis, in conjunction with his funeral in Savannah, Georgia occurring at the same time, and thereafter from 1pm onward, we will launch our local “occupation” to stand in solidarity with protests in New York, and across the nation and world. At 2pm Occupy Asheville will convene a "General Assembly" in Pritchard Park. Occupy Maine will rally at Monument Square in Portland tomorrow at noon. 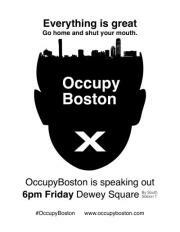 Occupy Boston will start an "ongoing protest" in Dewey Square tonight at 6. Occupy Chicago camped out in front of the Fed for the seventh straight night. 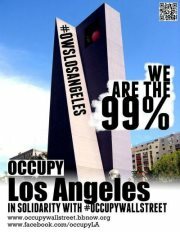 Occupy Los Angeles will march to City Hall and begin the occupation at noon. Some will rob you with a six-gun, some with a fountain pen. Bailout queen Bank of America will start gouging its customers for using debit cards next year because it can't gouge them for swipe fees any more. Bank of America Corp plans to charge customers who use their debit cards to make purchases a $5 monthly fee beginning early next year, joining other banks scrambling for new sources of revenue. U.S. banks have been looking for ways to increase revenue as regulations introduced since the financial crisis limited the use of overdraft and other fees. The Dodd-Frank Act's Durbin amendment, due to go into effect on October 1, caps fees banks can charge merchants for processing debit card transactions at 21 cents per transaction from an average of 44 cents, potentially costing banks billions of dollars. The American middle class became the turkey at the Thanksgiving dinner. It's not only that they didn't get a seat at the table, they were served on a platter. They fed those who got rich during the boom. Banks don’t like it when their imperial right to loot customers runs into interference, do they? The Charlotte bank is trying to preserve margins by circumventing the intent of new legislation, which was intended to stop what amounted to bank price gouging for debit cards (you can drive a truck between the cost of providing the service and what banks charged). That’s why it’s such a shame our bank regulatory apparatus has been co-opted by the industry. A competent regulator would beat back a brazen effort like this to game new rules. It’s hardly novel to say that the banking industry has become too large relative to the real economy and increasingly extractive in its posture. The industry needs to shrink, both in size in profits. ... The intent of the legislation was in fact that banks make less money on the debit card service; the BofA strategy to deal with it is tantamount to a stick in the eye. She recommends moving your money to a local bank, cancel your Bank of America credit card and tell a customer services representative exactly why you're doing it. Crain's New York Business is reporting that "veteran agitators" are flocking to Wall Street. Some of the biggest players in organized labor are actively involved in planning for Wednesday's demonstration, either directly or through coalitions that they are a part of. The United Federation of Teachers, 32BJ SEIU, 1199 SEIU, Workers United and Transport Workers Union Local 100 are all expected to participate. The Working Families Party is helping to organize the protest and MoveOn.org is expected to mobilize its extensive online regional networks to drum up support for the effort. 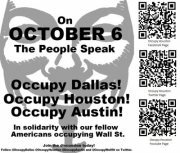 In addition to rapidly increasing support for the action in New York City, Occupy Wall Street confirmed over the phone that there will be at least 26 solidarity occupations in the U.S. by Oct. 6. Further, they said that up to 70 were possible by the end of October, and recommended visiting Occupy Together for more information. ﻿ You can tell this is a somewhat different animal than other politicized gatherings. No one knows what to expect. There are no explicit demands. It’s not very large. 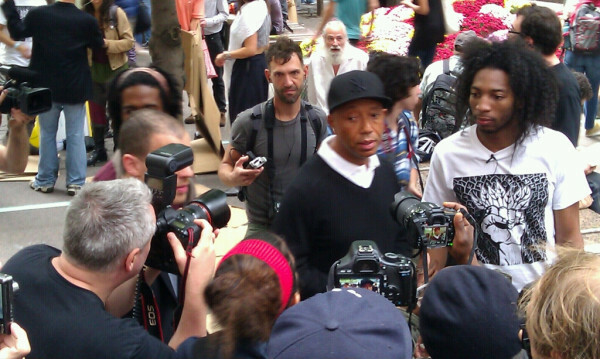 And yet, celebrities are heading to Zuccotti Park. Wall Street traders are sneering and angry. The people there are getting press, but aren’t dominated by it. We quickly checked a few other cities and found Occupy Chicago protesters had camped out for seven days in front of the Federal Reserve Bank as of Thursday. Occupy San Francisco appears to be growing from the handful of occupiers in the city's Financial District. 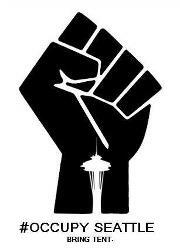 Occupy Seattle is up and running, preparing for a major action on Saturday. Remember the Club for Growth? It's the Koch-linked group that paid for a radio ad touting Koch whore Wisconsin Gov. Scott Walker's union-busting bill -- before lawmakers had even seen the bill. Now, according to Politico, the Club for Growth opposes a bill that would slap tariffs on products from China because it's manipulating its currency. That bill would create 2 million American jobs, according to the American Association of Manufacturers. 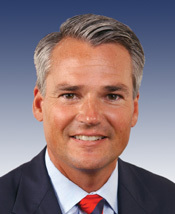 The Club for Growth's president is Chris Chocola, a former congressman from Indiana. Today he attacked the bill because it "would result in higher costs to American consumers." If signed into law, the bill would require the U.S. treasury secretary to analyze and report to Congress whether China is manipulating its currency to achieve a trade advantage. If manipulation is discovered, within 30 days after sending the report to Congress, the secretary must levy tariffs on all Chinese goods coming into the U.S. equal to the advantage gained by the Chinese through currency manipulation. Can you say "Man of principle?" Great news from Ohio, where efforts by Teamsters and others to fight the state's new voter suppression law are succeeding. Ohio Democratic Party chairman Chris Redfern told reporters earlier this week that the groups would hand in more than 300,000 signatures to Secretary of State Jon Husted, a Republican who supports the elections overhaul. Elections officials would have to verify the names to make sure they meet state requirements. Opponents need about 231,000 valid signatures to get a referendum on the law before voters next year. If they are successful, the law would be in limbo until after the presidential election. That's the earliest chance for voters to decide whether the law should be tossed out. The ballot repeal push does have consequences for the Nov. 8 election, when voters will decide whether to get rid of the state's contentious new collective bargaining law. Teamsters -- including Ohio's active Teamster retirees -- have been busy over the past few months collecting signatures to put the law on the November ballot. Denial. Not just a river in Egypt. Gov. Scott Walker says he isn't worried about a John Doe investigation of his current and former aides. That's because, Walker said, he is a man of integrity. "I know that throughout my career - first in the Legislature, then as county executive and now for the last 10 months as governor - I live by the standards I got from my parents," said Walker, whose father was a Baptist minister. "Certainly, they got me to the rank of Eagle Scout, and I continue to have that kind of integrity." Every time there's a new witness, this thing sprouts a new branch and heads in a completely new direction. That sounds like code to us for "rampant corruption." 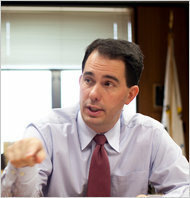 Oshkosh blogger The Chief offers up a comprehensive timeline of the federal investigation into Wisconsin corruption. It goes all the way back to 2005, when Walker was Milwaukee County Executive. This is a completely different ballgame and suggests, not only misappropriate use of public office, but also wholesale corruption and bribery: the presence of Kenneth Lucht (manager of community relations for the Wisconsin & Southern Railroad) on the immunity roster seems to indicate that Walker may have been aware of Wisconsin & Southern Railroad Co and/or Robert Friebert's plan to launder campaign donations through various employees. If Walker was aware of the scheme, and since the "donations" exceeded the legal limits, this could open up the potential for bribery allegations against the Governor. Ya gotta wonder what they're smoking in Michigan. A Republican House committee has approved a bill to fine teachers $1,000 and sentence them to a year in prison -- for using school email to discuss union activity or recruitment. Michigan educators could face a year in prison for conducting union or political business over public school e-mail servers under a bill advancing in Lansing. State House Bill 4052 was reported out of committee last week, and would prohibit a public employee from using public e-mail for political campaigning, union activities, union recruitment, and fundraising. Violators could be found guilty of a misdemeanor, which would carry a fine of up to $1,000, up to one year in prison or both in the bill's amended version. Organizations found guilty would face up to a $10,000 fine. Way to respect the profession, GOPers. On the other hand, at least this is one conservative-backed education reform that is entirely transparent about its objective. Charter schools, vouchers, Teach for America, merit pay, the elimination of seniority rules, and the new obsession with performance measures... these are all "reforms" that at their heart seek to pin the blame for our public education woes squarely on the backs of teachers, with the ultimate goal of busting the teachers unions. "Reformers" just won't admit it. So actually, just proposing to jail teachers, is at least much more honest. Isn't it interesting how a political party that claims to be opposed to big government is always so willing to use the power of the state to crush dissent by force? Let's not forget Michigan lawmakers also wanted to force foster kids to only buy clothes in second-hand stores. CBS quotes the owner of a Hallmark store in Dallas as saying “the cards are flying off the shelves.” The Texas unemployment rate reached 8.5 percent in August, its highest rate since the 1980s. 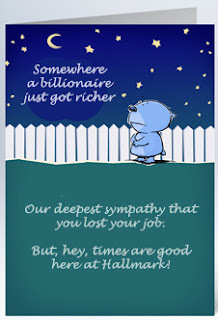 While unemployed Americans receiving these cards from friends and family would probably just prefer the cash, it remains to be seen how the cards will be delivered. About 120,000 Postal Service workers are at risk of losing their jobs. Under a proposal by agency administrators and several Congressional members, thousands of post offices and mail processing facilities could close and Saturday mail service could cease to exist. 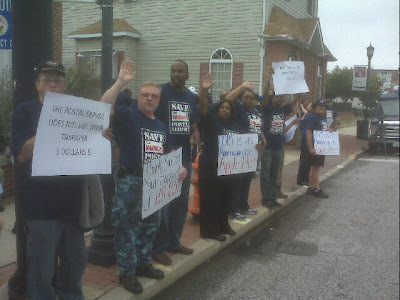 On Tuesday, Sept. 27, 435 rallies were held nationwide in support of USPS workers. "Irony" is an unemployment sympathy card going undelivered because the postal carrier is unemployed. Day 13: Occupy Wall St gathering steam. Even the MSM says so. Even the mainstream media concedes the occupation is growing. Reports Time magazine in a story titled, "Occupy Wall Street Protest: 12 Days and Little Sign of Slowing Down,"
A protest that began in utter dysfunction has given way to a fairly organized movement with a base camp for its most stalwart members, now numbering more than 300 people, who have slept in the park for 12 nights straight–and who say they intend to stay. The "Occupy" movement spread to four more U.S. cities, bringing the total to 74, according to the Occupy Together website. There are a dozen non-U.S. "Occupies" as well, including Finland, Hamburg, Perth and Manchester. "We are getting kicked out of our homes. We are forced to choose between groceries and rent. We are denied quality medical care. We are suffering from environmental pollution. We are working long hours for little pay and no rights, if we're working at all. 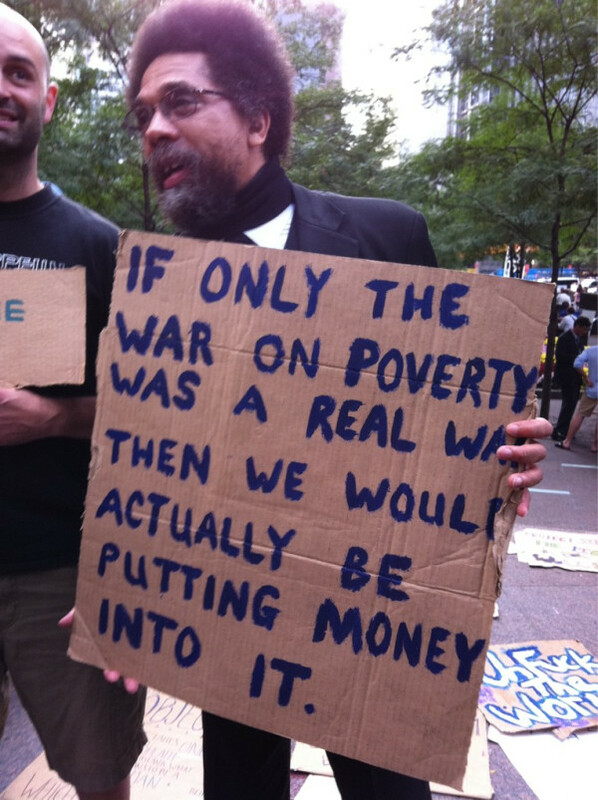 We are getting nothing while the other 1 percent is getting everything," read a post from the wearethe99percent Web site. Wall Street paid its employees $18.4 billion in bonuses in 2008 (for losing money) and $20.3 billion in bonuses in 2009, in addition the base salaries, dividends to shareholders, and rising profitability (leading to stock price appreciation), all of which add to the loot of Wall Street executives and employees. Currently there is a demonstration every day at 4 p.m. in front of the Federal Building at 2nd and Madison. Saturday there will be a demonstration starting at 10:30 a.m. at Westlake Plaza, lasting as long as anyone wants to stay. If that means overnight, we have occupation. A small group of protesters in Chicago started their own “Occupy Wall Street” demonstration over the weekend. Around 20 “Occupy Chicago” protesters gathered at Willis Tower, formerly known as the Sears Tower, on September 23 and then marched to the Federal Reserve Bank. Some of the protesters have remained camped out in front of the Federal Reserve Bank of Chicago, and the organizers said the “occupation” had more than doubled over the last several days. On Thursday, the “Occupy Chicago” protesters marched down Michigan Avenue and through Millennium Park. Although the “Occupy Wall Street” protest has been criticized by some for having no clear agenda or demands, one protester had three clear goals: repealing the Bush tax cuts, overturning the Citizens United decision and reinstating the Glass-Steagall Act. A quick roam around the Internets found the following actions: Occupy San Francisco will hold a march in the Financial District this afternoon. Occupy Lexington, Ky. will hold a rally at the JP Morgan Chase bank at noon. Occupy OKC will hold a General Assembly in Oklahoma City tomorrow. Occupy Boston officially starts tomorrow in Dewey Square. Occupy Milwaukee is meeting tonight. Hard to ignore it anymore. American corporations looted hundreds of billions of dollars from their pension funds and used their booty to reward top executives, according to a new book called "Retirement Heist: How Companies Plunder and Profit from the Nest Eggs of American Workers," by Ellen Schulz. Siphon billions of dollars from their pension plans to finance downsizings and sell the assets in merger deals. Overstate the burden of rank-and-file retiree obligations to justify benefits cuts, while simultaneously using the savings to inflate executive pay and pensions. Hide growing executive pension liabilities, which at some companies now exceed the liabilities for the regular pension plans. 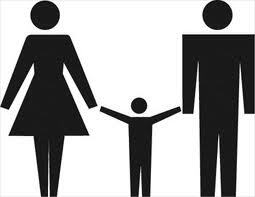 Purchase billions of dollars of life insurance on workers and use the policies as informal executive pension funds. When the insured workers and retirees die, the company collects tax-free death benefits. Exclude millions of low-paid workers from 401(k)'s to make the plans more valuable to the top-paid. Schultz cites this example of one well-known company whose pension fund has dropped significantly since the early 1990s. General Electric announced it was closing its pension plan to be more competitive. She says the company's financial filings show that GE has not put a cent into its pension plans since the mid-1980s. Over the years, GE, like most large companies, used assets in the plans to pay for other things. 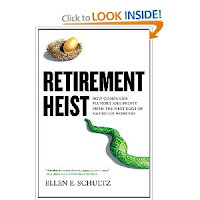 And now that there is no more money left to plunder, corporations have decided to dump defined-benefit plans and move into less costly and more risky defined-contribution plans, shifting the retirement burden onto workers and leaving them at the mercy of this volatile wolf market. Somehow, none of this is surprising. In case you haven't seen. More than half a million people have viewed this youtube video in the past two weeks. That's what's known as going viral. The rich will be just fine if we raise their taxes; they’ll still be rich, but in the aggregate will invest less money in our economy. The resulting reduction in job-creating investment, however, will punish workers and those who desperately want and need to become workers again. Right. That's exactly why U.S. corporations are sitting on $2 trillion worth of cash after firing 2.9 million American workers and hiring 2.4 million workers overseas in the past decade. Thank you for standing up for progressive values, and for showing other Democrats how to fight against the Republicans' 'class warfare' nonsense. Showing once again that he’s an idiot who knows nothing about healthcare pricing, premium wine enthusiast Paul Ryan wants to tax employer-sponsored health plans. So trying to take away Medicare just wasn't enough for him. Republican Representative Paul Ryan, an outspoken opponent of President Barack Obama's healthcare reform, proposed a plan on Tuesday that could effectively dismantle the way most Americans get health insurance by reducing incentives to join employer-sponsored plans. Ryan said the government should replace the income tax exclusion for people who get employer-sponsored healthcare and replace it with a refundable tax credit that they could use to purchase coverage on their own. Some 170 million Americans are now covered through the workplace. Ryan argued it would give consumers the needed incentive to demand better value out of their healthcare. No, it wouldn't. It would force employers to drop their health plans and pit individuals against insurance companies. We all know how that will end. 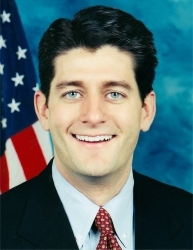 Why does Paul Ryan hate America? 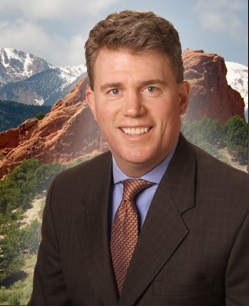 ﻿﻿﻿﻿﻿﻿While state lawmakers are busy passing “voter ID” laws to disenfranchise voters, Colorado’s Republican Secretary of State Scott Gessler has taken his voter suppression efforts to court. Gessler has asked a Denver judge to issue a preliminary injunction preventing the Denver Clerk and Recorder from mailing ballots to certain “inactive” voters. Two Democratic Congressmen have already asked the U.S. Department of Justice to investigate whether Gessler violated federal law with his request. Gessler’s efforts could have a particular impact on Initiative 300, a ballot referendum to allow Denver workers to earn up to nine paid sick days a year. The referendum will be decided by all-mail-in balloting. Those who face being disenfranchised are “inactive” voters, eligible voters who have missed one general coordinated election. Gessler is challenging the Denver Clerk’s authority to mail ballots to these voters, which could amount to 55,000 eligible voters who will not get to vote this fall. 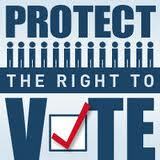 Voter suppression disenfranchises seniors, the poor, students and minorities. And voters who participate in the 2011 election are also more likely to participate in 2012. The letter from Rep. Robert Brady of Pennsylvania and Charles Gonzalez of Texas says Gessler's actions may violate the Voting Rights Act, which prohibits discriminatory voting procedures. "Given the diversity of the state of Colorado, and particularly that of Denver County, there is a high likelihood that the barrier to voting Secretary Gessler seeks to impose . . . will have such a discriminatory result," the letter states. It says that not mailing ballots to eligible voters listed as "inactive" because they didn't vote last year "might make participation particularly hard" for disabled voters who may not have been able to get to the polls and Americans who may have been deployed to Iraq or Afghanistan in 2010 but who want to vote Nov. 1. 09/23/11; from JRL on Vimeo. I am asking the United States government to raise my taxes and not allow the Republicans to use this economic recession as an opportunity to strip the basic programs that protect our most vulnerable. A photo gallery of the occupiers can be found here. For those committed to criticism of Occupy Wall Street, this must have been disappointing because these “hippies” most definitely do not appear to be out-of-touch with Main Street. 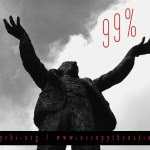 The protest against inequality and corporate control of the government is spreading to 70 cities in the U.S. A list of the occupations can be found at http://www.occupytogether.org/. There'll be an occupation of a JP Morgan Chase bank in Lexington, Ky., tomorrow, according to the Hillbilly Report. 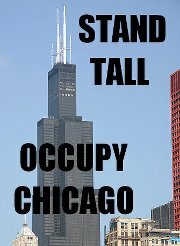 Occupy Chicago has encampments at the Federal Reserve, Millennium Park and Willis Tower, according to Business Insider. About 50 camp out during the day, with a dozen sleeping overnight. ...the people behind Occupy Boston showed a strong dose of media savvy and organisational skill on Monday night, as they drew a committed crowd of volunteers to their cause: to occupy a slice of the city. Local TV crews were in attendance at the evening mass planning meeting, and it had been flagged on the front pages of Boston's newspapers. Finally, here's an astute observation from Emily Manuel at In These Times. America’s political classes would do well to listen to the grievances of those involved with Occupy Wall Street, for they undoubtedly represent a set of anxieties shared by a great deal of the population. The corporate take-over of the American political process has not gone unnoticed, neither has the disparity between continued Wall Street profits and the cuts to the welfare state. As unemployment continues at high numbers, resentment surely stirs among those whose lives are slowly being drained at the expense of the corporate state. At Amazon, the safety and well-being of our employees is our No. 1 priority. Many of us are seeing the ugly reality behind the happy talk about 'valued employees.' Corporations are attacking their employers with a savagery not seen in decades. Not because they're struggling. Just because they can. Take Sotheby's, which tried to eliminate retirement benefits for current workers and union protections for all new workers despite record profit. Or Atlantic City casino operators, who want to destroy health and pension plans for gaming workers who belong to UNITE-HERE. Or Madison Dearborn, the private equity firm that owns VWR International, a laboratory supply company that refuses to grant employees decent working conditions after five years of negotiations. Just because they can. They are coming after us. Listen to Corporate America's quislings. They are openly attacking organized labor in ways unthinkable 30 years ago. Everybody in this room and in countless other rooms across this great country has his or her favorite Reagan story. For me, that story happened thirty years ago, in August 1981. The air traffic controllers, in violation of their contracts, went on strike. President Reagan ordered them back to work, making clear that those who refused would be fired. In the end, thousands refused, and thousands were fired. I cite this incident not as a parable of labor relations but as a parable of principle. Ronald Reagan was a man who said what he meant and meant what he said. Those who thought he was bluffing were sadly mistaken. Reagan’s demand was not an empty political play; it was leadership, pure and simple. The Reagan who challenged Soviet aggression, or who attacked a Libya that supported terror was the same Reagan who stood up years before to PATCO at home for what he believed was right. Props to our brother Ed Dini, a member of Local 249, who got his letter published in the Pittsburgh Tribune-Review. 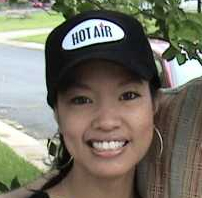 The newspaper had recently run an absurd column by Michelle Malkin. Following Fox News' lead, she distorted Teamsters General President Hoffa's Labor Day speech in which he said we need to vote the Tea Party out of office. Malkin claimed he was inciting violence by saying we need to "take out" the Tea Party. Only by doctoring his remarks -- which Fox did -- could that interpretation be made. As a 20-year Teamsters member (Local 249), I was disgusted by the column "How Obama protects Teamsters" (Sept. 12 and TribLIVE.com), which is unfortunately typical of Michelle Malkin, a nasty apologist for extremist billionaires who think workers make too much money and they don't make enough. As is often the case with tea party spokespeople, Malkin is guilty of exactly what she accuses others of doing. She calls Teamsters President James Hoffa "uncivil," accuses him of "street-gang authenticity" and calls union members "goons." She will never call out Wall Street billionaires or corporate CEOs, no matter how guilty they are of wrongdoing. She has never expressed concern about the inequality that is destroying our country. And she will never defend organizations that support workers' rights. That's because her mission is to protect the oligarchs who sign her paycheck and to smear anyone who dares to criticize them. Malkin has long been protected and supported by anti-worker billionaires like the Koch brothers. She worked for the Competitive Enterprise Institute, a so-called "think tank" funded by the Koch brothers, the Coors heirs and the Bradley brothers, one of whom founded the John Birch Society along with Fred Koch. She gains further exposure from billionaire Rupert Murdoch, whose right-wing media empire is under investigation for hacking into a murdered woman's voice mail. Malkin is a provocateur in today's class warfare, and she's not on the side of working families. From the Man in Black, circa 1969. Or should they just let the FBI do their work for them? Occupy Wall Street protesters joined U.S. postal workers in a march this afternoon. 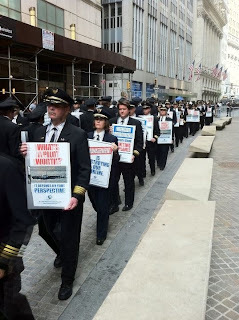 Separately, more than 700 United and Continental pilots picketed on Wall Street to raise questions about the merger of the two carriers, according to the International Business Times. Oh, and Princeton professor Cornel West is there too. So many workers (and non-workers) have so many grievances it's probably not surprising they should meet up. @LukeSkywalker: Our #occupywallstreet peeps just met up with a big group of postal workers! What a party! We Are One. 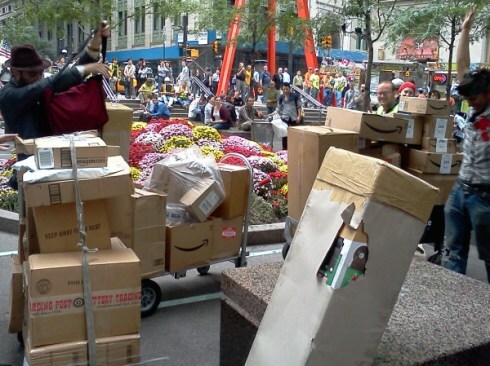 @coupmediagroup: #OccupyWallStreet makes it to Postal Workers Rally! "we dont want no bailout, we just want the mail out!" #solidarity = #winning! More than 700 Continental and United Continental pilots took to Wall Street on Tuesday to protest slow contract negotiations and misinformation regarding merger integration. The demonstrating pilots marched together, queitely, in order and in full uniform, holding two signs. "Merger Progress is More than Painting Airplanes," said one sign. "Management is Destroying our Airline," said another sign. 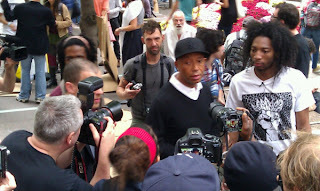 West will speak to the Wall Street occupiers at 7 pm tonight. They're about to begin: rallies in every congressional district in the country to support Postal Service workers, prevent 120,000 layoffs and preserve America's middle class. The rally pictured above began already in Catonsville, Md. 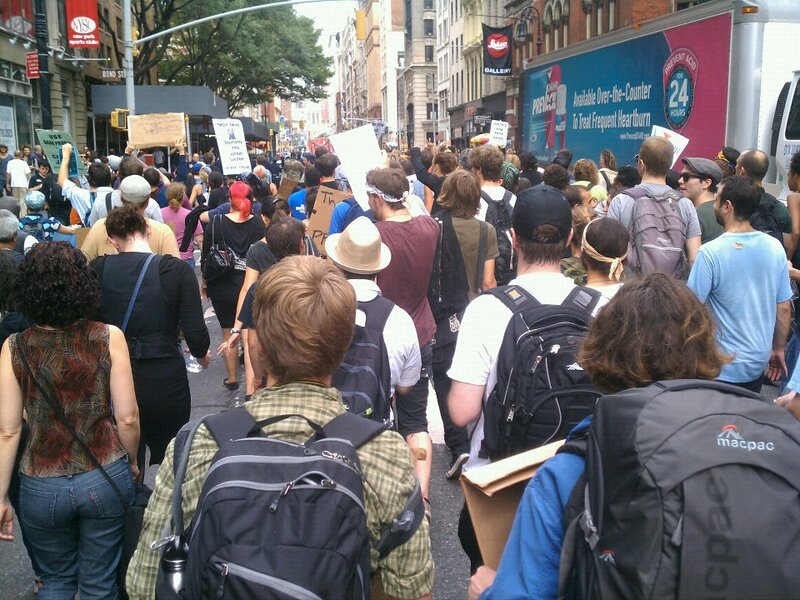 And in New York City, a loud, energetic march has gotten started. Under the guise of a “budgetary crisis,” some in Congress are going after the USPS, proposing massive cuts and layoffs—including laying off 120,000 workers, closing thousands of post offices, eliminating Saturday mail service and closing mail processing facilities. Massachusetts Rep. Stephen Lynch introduced a bill to solve the Postal Service's financial crisis. Crushing postal workers and slashing service will not solve the U.S. Postal Service’s financial crisis, APWU President Cliff Guffey said. Congress created this mess and Congress can fix it. The USPS economic crisis is the result of a provision of the Postal Accountability and Enhancement Act of 2006 that requires the Postal Service to pre-fund the health care benefits of future retirees—a burden no other government agency or private company bears. —will join forces with members of our communities to send a message to the nation and its Congress. Let's give a warm welcome to our 40 new brothers and sisters at Local 734 in Chicago. They deliver homemade Italian, French and German breads for the Labriola Baking Company in Alsip, Ill.
Keep an eye out for those familiar red and black Labriola trucks driving around Chicago. The next time you see one, you’ll be passing a Teamster. ...by standing together, they’ve stayed the course toward a powerful Teamster contract. Local 734 has represented bakeries and bakery drivers for more than a century, and we couldn’t be more excited to welcome Labriola to our proud tradition. Just days before the successful election, Teamster representatives from around Illinois rallied behind the drivers in Alsip. Teamsters Local 458M, Local 700, Local 703, Local 727, Local 731, Local 786 and other affiliates showed their solidarity for hours on the city’s south side, shaking hands and speaking with workers. Joint Council 25 President John Coli said the Labriola drivers should be incredibly proud of themselves. As a growing Chicago company, Labriola has seen record profits in its industry. It’s gratifying to see workers claim their stake in its success and its future. Here's the brand new "No on Issue 2" television ad that We Are Ohio will air tomorrow. A "no" vote on Issue 2 in November is a vote against SB5, the anti-union bill psased by the Legislature earlier this year. The contest has tightened, but if the election was held today, Ohio voters would still reject the state’s controversial new law restricting public-employee collective bargaining, according to a poll released Tuesday. The latest Quinnipiac Poll revealed a 13-point gap between support and opposition for Senate Bill 5, down from a 24-point gap in late July. Fifty-one percent of registered voters questioned said they’d vote to kill the law while 38 percent said they want to keep it. The poll is the first to be released since both sides went on the air in the battle for the hearts and minds of Ohio voters with competing ads that argue that the law is a deliberate attempt to demonize public workers or that the law is necessary to reset a system that now weighs too heavily in favor of unions. “Backers of SB 5 have only six weeks to make up the difference, although public opinion appears to be moving in their direction,’’ said Peter A. Brown, assistant director of the Connecticut-based Quinnipiac University Polling Institute. A conservative group headed by Barry Bennett, Rep. Jean Schmidt’s former chief of staff and Mary Cheney, daughter of the former vice president, has started flooding Ohio voters’ mailboxes this weekend with flyers urging a “yes” vote on Issue 2, which would keep Senatae Bill 5 in place. The group, based in Alexandria, Va., is called the Alliance for America’s Future, and plans to make several mailings into Ohio to help the campaign to preserve Senate Bill 5, which would limit the collective bargaining rights of public employees. Bennett, who left as Schmidt’s chief of staff early last year to head the group, said “millions” of Ohio voters will see the mail pieces which are being sent out independently of the official “Yes on 2″ committte, Building a Better Ohio. The Wall Street occupiers are still holding down Fuccotti Park even as protesters begin to plan and carry out actions around the country. In Chicago, protesters have been camped out in front of the Federal Reserve Bank since Friday. 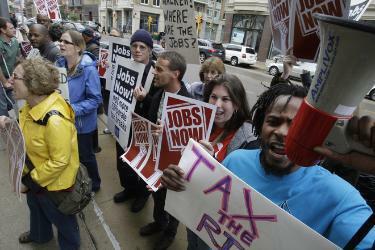 In Wisconsin, protesters rallied outside of the Metropolitan Milwaukee Association of Commerce today as Koch whore Gov. Scott Walker spoke inside. Occupy Portland today boasted 3,000 members as it plans a march next month. Yesterday in New York, protesters were buoyed by visits from celebrities Michael Moore and Susan Sarandon yesterday. It never changes from the top, it only changes from the bottom, and this is great. "It warms my heart to see all of you here," Moore told the few hundred people gathered at Zuccotti Park as part of the "Occupy Wall Street" protest. 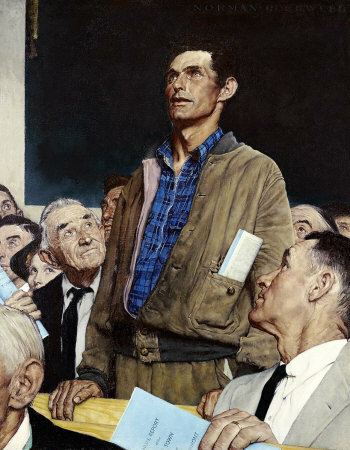 He told them they each represented thousands of other Americans, and to not lose heart, that "our power is derived from the people." ...dozens of more locales across America are expected to be swarmed upon by citizens sick and tired of corrupt corporations and financial institutions run amuck by mismanagement and greed. Monday's protest was a huge success. THANK YOU ALL, we are keeping up this effort every day this week and protesting outside the Federal Building (915 Second Ave.) every day this week from 4:00 pm on so we catch people during rush hour. Below is this week's remaining schedule: Tuesday September 27th - 4pm Wednesday September 28th - 4pm Thursday September 29th - 4pm Friday September 30th - 4pm Saturday October 1st - 10:30am October 6th - ? Join us. Protesters in Milwaukee chant "jobs now" as Governor Scott Walker holds the second of three job creation forums Tuesday in Milwaukee. Walker met with local businesses at Metropolitan Milwaukee Association of Commerce. Just a taste of our power through collective action! An action is planned for Oct. 8 in Indianapolis. Occupy Atlanta holds a planning meeting tomorrow night. 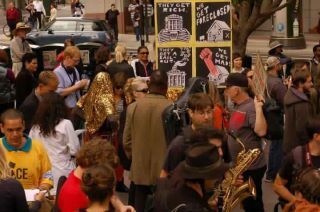 Occupy New Orleans is getting organized, as are dozens more groups across the country. UPDATE: Here's a twitter guide for each city here. 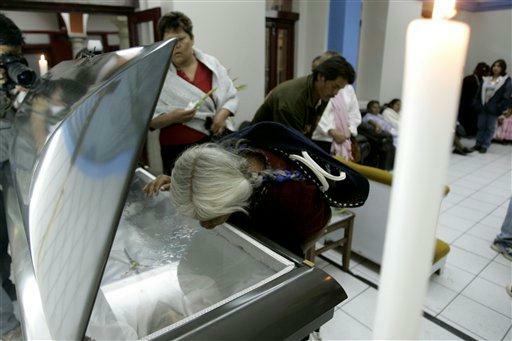 Visitation of slain union leader. We know the Internet can be a vile place where anonymous trolls post nasty anti-union remarks. 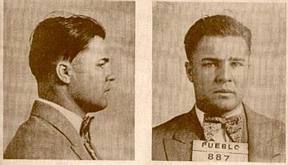 But recent comments at the bottom of The Hill's story advocated the murder of union leaders. Included with the letter was a list of names of the 22 union leaders who have been killed in Colombia, 15 of those after the United States agreed to a labor action plan with the South American country in April to improve its labor rights record, according to the AFL-CIO. Labor has long vehemently opposed a trade deal with Colombia because of its record of violence against union activists. I serve as President of a major corporation in the U.S. All these people want to do is create trouble for us. I look forward to the day we have a government that is sympathetic to the job creators and allow us to handle the unions like Columbia has done. Sounds like the Colombians don't like the unions either. Colombia understands the evil nature of unions. and the damage they do to a country. What do you call a list of 22 dead labor leaders? so Columbia is doing a good job of getting rid of vermin why is this cause for concern? Could we get them to do it here? There are more than enough union thug bosses already. The US should not be party to a free trade agreement with a country with such high levels of human and civil rights violations, and such rampant violence against workers. 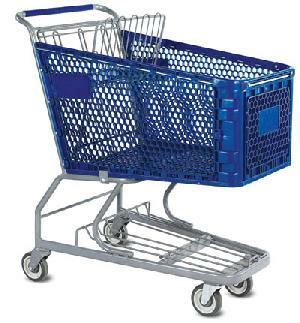 We're glad to see that self-serve lanes in supermarkets are starting to disappear. Many customers apparently prefer to deal with actual skilled people rather than machines. The Associated Press reports that supermarkets are getting rid of their do-it-yourself machines to improve customer service. Supermarket chains started introducing self-serve lanes about 10 years ago, touting them as an easy way for shoppers to scan their own items' bar codes, pay, bag their bounty and head out on their way. Retailers also anticipated a labor savings, potentially reducing the number of cashier shifts as they encouraged shoppers to do it themselves. The reality, though, was mixed. Some shoppers loved them and were quick converts, while other reactions ranged from disinterest to outright hatred , much of it shared on blogs or in Facebook groups. An internal study by Big Y found delays in its self-service lines caused by customer confusion over coupons, payments and other problems; intentional and accidental theft, including misidentifying produce and baked goods as less-expensive varieties; and other problems that helped guide its decision to bag the self-serve lanes. Only 11 percent of workers in this country have access to paid family leave through their employers. The United States is the only developed country that does not ensure working parents can take job-protected, paid time away from work to be with a new child. Working parents are speaking out tonight on how to build a family-friendly nation through paid family leave programs for new parents. The discussion should be of interest to anyone who supports worker rights. The tweet chat at 9:30 p.m. ET is hosted by Working Mother and the National Partnership for Women and Families. They want to hear your stories about maternity and paternity issues, as well as ideas to push senators and representatives to make families a priority and enact paid parental leave standards. Where and When: Tuesday, Sept. 27, 9:30-10:30 p.m. There is also a petition to call on Congress to enact paid family leave. Sign it here. Kathy Bowers, a member of Teamster Local 238 in Iowa City, Iowa, is back on the road after a long 15 months. The driver for Durham School Services, a school bus company, finally opened the doors to her bus earlier this week after being let go by the company more than a year ago. So when Bowers backed her bus into a parking space, catching the mirror on another bus last spring, Durham jumped at the chance to fire Bowers for what it claimed was an accident. Bowers argued her case, but the company refused to listen. This was something we knew we were going to fight. This really wasn’t an accident—there was no damage to the bus and no cost to the company. Instead of breaking off, the mirrors are designed to pop out and that’s exactly what the mirror did. The mirror was simply popped back into its bracket, but Kathy was fired. I was ecstatic. I can honestly say that Durham was trying to bust the union. It was nice to see the union come through and show Durham that we aren’t going anywhere. I just love the kids. I really like talking to the kids that ride my bus and learning their interests. For me, bus driving is freedom—it’s not sitting behind a desk all day. Tell the Super Committee: Focus on Jobs! !